Grow and improve your business by gathering quick & easy feedback through SMS. SMS Surveys are a great way for your business to collect valuable information on your customers, allowing you to improve your businesses and ultimately improve customer satisfaction. Using our online platform, you can easily create your very own bespoke, intelligent survey, and collect better customer feedback in a cost effective way. Find out how engaged your customers are and what they like and dislike about your business by sending them a simple SMS Survey. You'll be able to quickly pick up responses and with our innovative, easy to use online platform, analyse the answers and opinions easily. You can then make those small changes to your business, be it improving your products or services, that will increase your customer satisfaction and retention. Understand where your customers fit into your market with a series of engaging text messages to gain valuable insight to grow your business. Discover what new customers needs and drives are, explore new markets and measure brand awareness easily. A text survey can do all this and more through your audiences mobile phone, this in turn gives you the best possible response rate, in the quickest way possible. It is imperative for all businesses to update the data they have on customers regularly, this ensures that correct messages are being sent to them. SMS Surveys offer businesses a quick and cost effective way to collect and update their customers information (when comparing to other channels like manual calling and post). 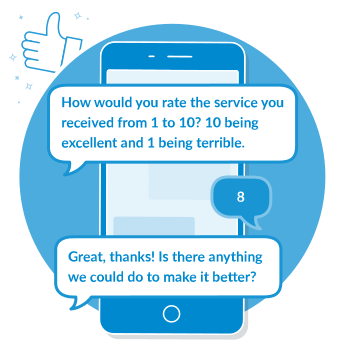 Our SMS Surveys give businesses the chance to ask a series of questions to ensure that their customers details, likes and dislikes, and preferences are up to date. These questions do not have to be answered immediately and can be answered when best suits the customer. Want to find out how satisfied your staff are? Or would you like to know what their thoughts are about the changes that are happening in your business? Simply collect their feedback with an SMS Survey. A quick and unintrusive survey is an easy way to find out how your employees feel. By sending them a text message, staff can complete the survey at any time with no need to be at work to complete it. Once your employees have given their feedback, you will then be able to analyse their feedback and improve your business to ensure your staff are happy. SMS Surveys provide businesses with an easy way to manage and organise events, where individual requirements can be catered for. With a mobile-friendly survey you will be able to confirm attendee's contact details, food preferences, and sort any special requirements they may need, all with a series of simple text messages. Using our online platform you will be able to store all of your attendee's replies, helping you organise and run your event. SMS can save you money when collecting personal data, compared to traditional communication methods. By sending your customers a text message, you will increase the chance of receiving a reply. By contacting your customers through SMS, they will be able to provide feedback at a time best suited to them. Our SMS Surveys API can quickly and easily be integrated into your CRM system. By collecting valuable customer data, you can make better and faster business decisions. Create your very own bespoke text message survey quickly and easily using our online platform. Analyse your responses as they come in on our intuitive dashboard. Vaillant Group required a way for their customers to provide feedback on site engineer visits, they looked to build on their existing SMS communications and decided SMS Surveys was for them. See how Vaillant used SMS Surveys to improve their services. How can SMS Surveyes improve my business? SMS Surveys will help you make better and faster business decisions. Here are our SMS Survey features that will help you get there. Our online SMS platform will allow you to easily collect data in a matter of minutes. Ask the right questions for your target audience; YES/NO, NPS, and free-type answers. 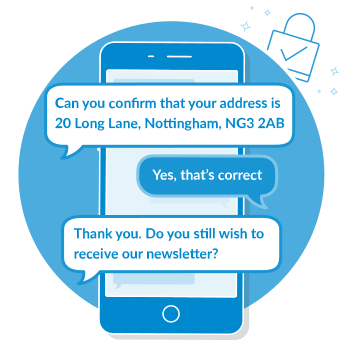 Personalise your surveys by adding recipient's details to make them more engaging. Check how your SMS Survey campaign is performing with real-time updates and see individual responses as they arrive. Ask a series sequential questions, or ask different questions based on answers provided. Find out how your customers buying process went with a triggered survey immediately after your customers complete an order. Want to know more about SMS Surveys?